The film shies away from the big names and big institutions and offers a history of women’s rights organizing from the ground up. 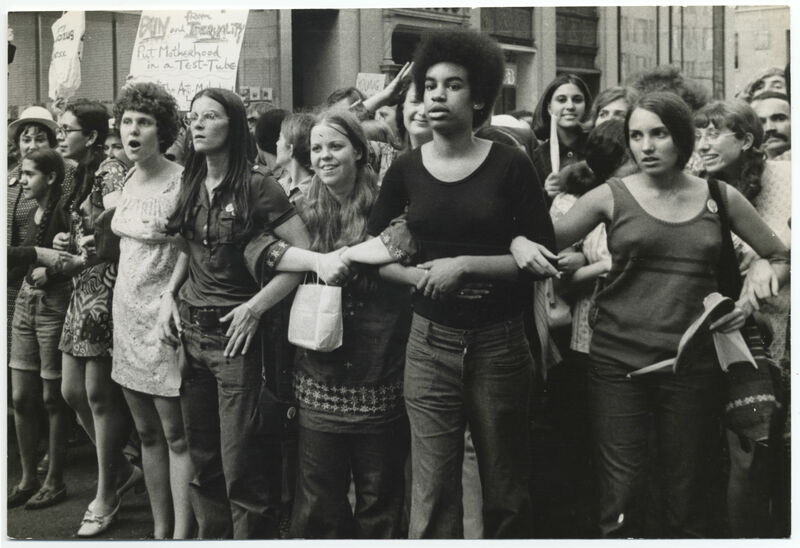 The new documentary She’s Beautiful When She’s Angry, which chronicles the movement for women’s rights in the sixties and early seventies, is nothing if not timely. It’s touring the country just as the concept of the grassroots movement as the spark for social change is having a moment. Thanks to the incredible film Selma, which puts movement strategy and ferocious hope on equal footing with personality and electoral power, and in large part because of #BlackLivesMatter organizing, the American public is grappling with the question of how change happens. They’re wondering aloud what would make a person go back to the Edmund Pettus Bridge—as hundreds of civil rights activists do in Selma—after whip lashes and clubs rained down on them the last time they tried it. A person who typically doesn’t give mass movement a second thought—the type who was confused by the “community organizer” part of Obama’s résumé—may be infuriated or dismissive if #BlackBrunch shows up in their neighborhood cafe, but they’re talking about the tactic just the same. That counts for something. Simply getting people talking was a goal then as now, and late in She’s Beautiful When She’s Angry historian and feminist Ruth Rosen recounts a series of events that proved how dangerous even that can be. The women’s movement had become such a successful, persistent presence—shutting down all-male congressional hearings on birth control safety, for example—that J. Edgar Hoover feels it’s a destabilizing threat. The Bureau discriminates just like most employers, and so doesn’t hire women as agents. But it sends a team of informants to spy on consciousness-raising groups. Soon the infiltrators are bored. They report back that these women are just talking about their husbands’ refusal to help out around the house and how subsidized childcare really would be a nice thing. There’s nothing revolutionary happening at these meetings, the spies say; attending them is a waste of time. But Hoover is adamant that his informants stay the course, calling feminist organizers a national security threat. The film takes as its focus the protests, campaigns, confrontations and provocations—as often outlandish as earnest—the movement instigated, and it mixes the history you know and expect, like the burning of bras at the Miss America pageant in ’68, with lesser-known stories, like the role women in the Young Lords played in exposing forced sterilization in Puerto Rico and New York City. This documentary doesn’t pretend there weren’t elbows thrown, disagreements over leadership styles, or divergent agendas. The film has no narrator, and so the women who made up the movement—those who learned to provide safe, if not legal, abortions as part of the Jane Collective, those who didn’t identify with the movement’s focus on white women’s concerns and so formed Black Sisters United, those who ran street patrols when a string of Boston murders targeting women hit the headlines—speak for themselves. There’s no objective voice to guide the story. Instead, director Mary Dore offers what feels like an unvarnished telling, trustworthy in part because these women were dealing with many of the same messes and contradictions we still struggle with today, particularly the fractures within movements. There are plenty of similarities between then and now, but the differences are even more interesting. I came away from the film thinking that the goals of that era’s women’s movement had been loftier. After all, organizers had nearly been successful in getting Congress to pass the Comprehensive Child Development Act, a bill that would have created sliding-scale early-education and after-school programs nationwide. Nixon vetoed it, positioning himself as the sole voice of reason standing between American women and a kind of Soviet obliteration of true motherhood. But Congresswoman Eleanor Norton Holmes is featured in the documentary, recalling what that historic fight for childcare felt like from an activist’s perspective. There’s also a vigorous conversation about marriage that feels eons away from the current largely uncritical approach to the institution. “If women are to be married, women should receive pensions,” activist Jacqui Ceballos, who was active in NOW, is seen telling a crowd in the film. Today we’re bombarded almost daily by sky-is-falling propaganda about the social ills associated with singledom and single parenthood, and few major feminist organizations mount serious counter-arguments. She’s Beautiful When She’s Angry is screening in theaters nationwide now.